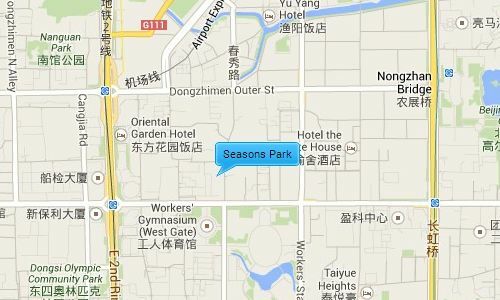 Seasons Park is situated close to the 2nd east ring road giving it easy access to some of Beijing’s main destinations like city airport, the Olympic village, and the Zhongguancun. It is also next door to two popular expat area; Sanlitun and CBD, which both contain a vast range of restaurants, shopping malls, supermarkets, health centers and a buzzing night life. It is also close to a major embassy district to the east. Seasons Park has a total construction area of 704,000 square meters, and a total land area of 121,803 square meters. The compound consists of 27 buildings in total built in 3 phases. The apartments range from a 70sqm 1 bedroom layout to a 400sqm 5 bedroom layout. Season’s Park has a large community of expat families, and has a Kindergarten on-site, it is also managed by an international company with English speaking staff.